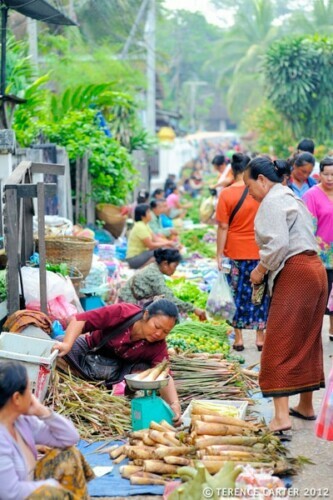 It’s early morning in Luang Prabang and while the sleepy town is just starting to come to life, the bustling morning market has been busy since 3am, when vendors started arriving from rural villages and the Mekong river. For many of them, there was a couple of hours of travel to get here. 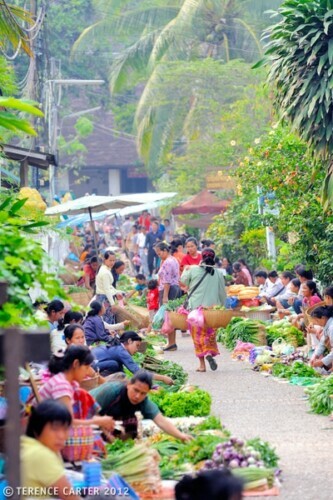 The open-air, fresh food market is essentially comprised of two long skinny, perpendicular lanes forming a ‘t’, in the heart of historic Luang Prabang. 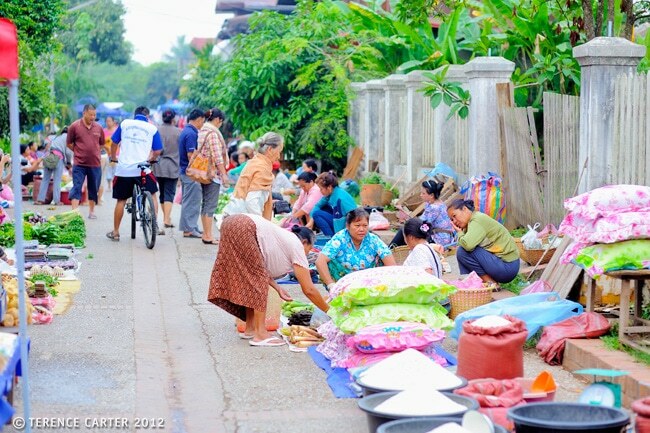 The vendors are mostly women and they kneel or crouch behind the plastic tarpaulins upon which they display their produce, chatting to their neighbours between sales. 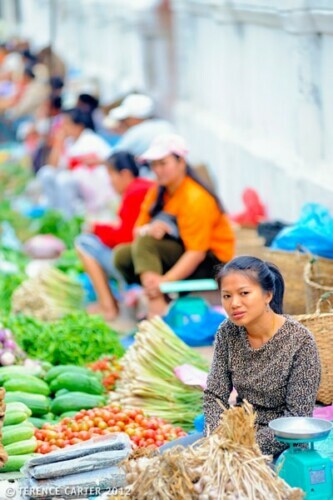 The women take great pride in displaying their beautiful but often meagre amount of produce. It’s one of the most photogenic markets I’ve ever been to and it immediately makes me want to cook. 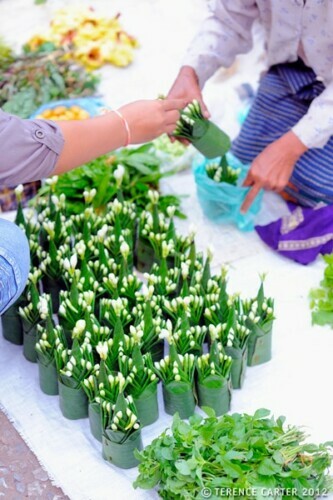 Markets in Luang Prabang, Laos. Markets in Luang Prabang, Laos. Part of the cooking course at Amantaka. Amantaka cooking course venue, Luang Prabang, Laos. 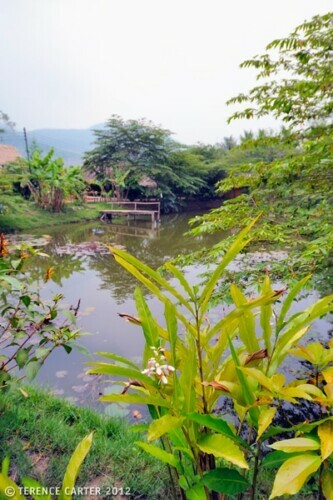 Organic farm at the Amantaka cooking course venue, Luang Prabang, Laos. 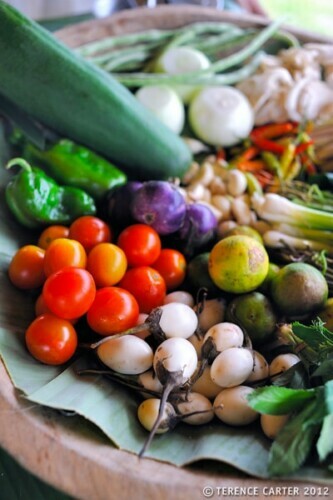 Organic farm produce at the Amantaka cooking course venue, Luang Prabang, Laos. 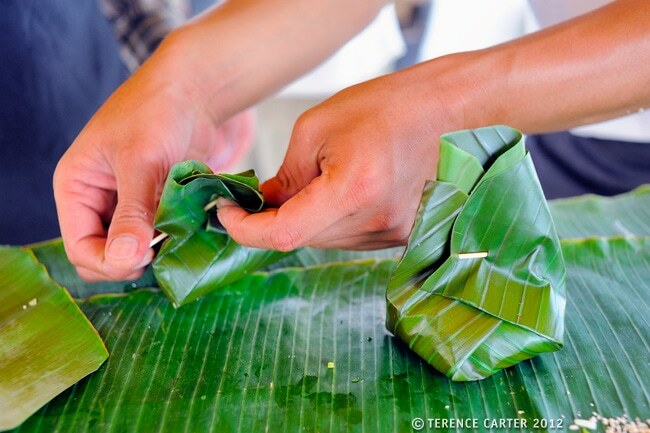 The Amantaka cooking course, Luang Prabang, Laos. 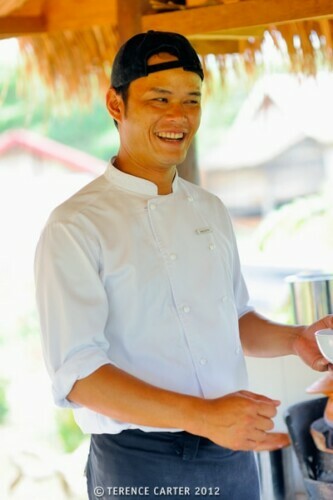 Chef at the Amantaka cooking course, Luang Prabang, Laos. 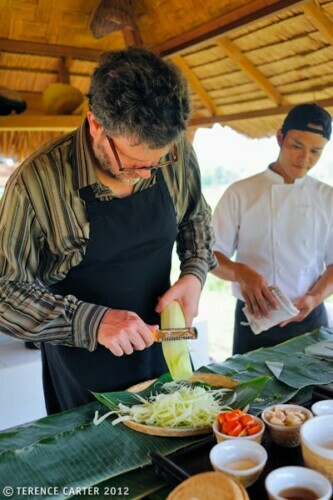 Serving lunch at the Amantaka cooking course, Luang Prabang, Laos. 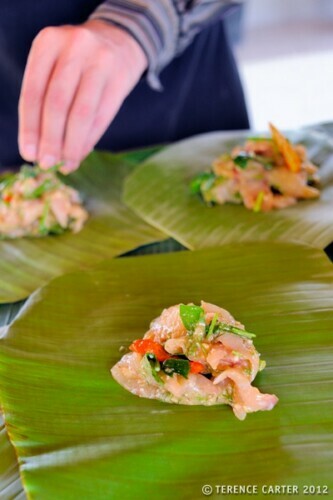 A dish at lunch at the Amantaka cooking course, Luang Prabang, Laos. Anousith has been cooking in Luang Prabang for 10 years and has worked at the Amantaka resort for two years and the experience shows. As we stroll, Anousith introduces us to the different vegetables, fruit, roots, leaves, and herbs for sale and explains its use. 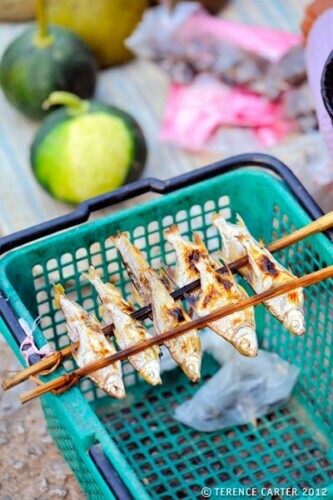 He also introduces us to his mother and aunts, who sell fermented fish at the market. There is a great variety of produce on offer (perhaps even more than at Phousi market, which we visited the day before and were impressed with) and each ingredient we’re introduced to has a specific role to play in the oeuvre of local dishes: sugar cane is “only for dessert,” Anouisth reveals. Bamboo shoots are important to soups. River-weed (like seaweed but from the river) is used with pork, and chilli wood for stews, the chef explains. The fresh greens are amazing: different lettuces, spinaches, mint, basil, coriander, dill, spring onion, and several types of eggplant. As the vendors have been here for hours, many are tucking into their street food breakfasts, which they have bought from roaming street food vendors who wander through the market, or from nearby street food stalls that have set up for market shoppers. Rice porridge, sticky rice with chilli paste, and the rice noodle soup with a ragu Bolognese-like meat sauce, Lao khao soi, are the most popular dishes to start the day. We’re starting to get hungry. 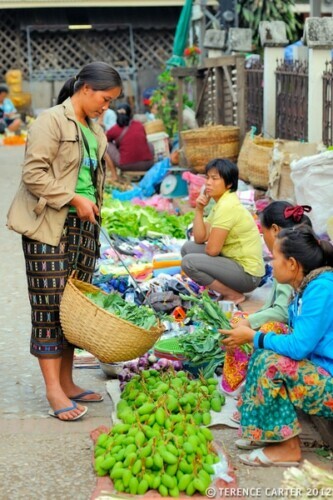 We let Anousith get back to sourcing some ingredients for our Lao cooking course and we do another lap of the market on our own to get more photos before returning to the Amantaka for our own breakfast. A short while later we’re being driven out to the organic farm in the bucolic Luang Prabang countryside where the Amantaka offers their Lao cooking course. Lush and green, surrounded by mountains, it’s an idyllic spot. But it’s more than just a farm, it’s a sustainable community enterprise. 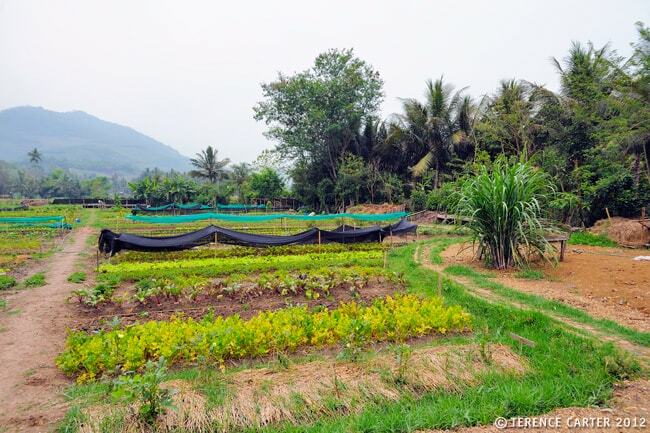 Called ‘The Living Land’, the 10-hectare farm is owned and worked by the local community and is entirely organic — that means absolutely no chemicals, fertilisers, fungicides or pesticides. They use tobacco as their main insecticide, and the farm manager Mr Sai tells us with pride that they’re trying a mix of tobacco, garlic, chilli, lime powder, lemongrass, and rhubarb leaf, which has a natural poison, as an insecticide. There is a well on site for water and they create their own compost. As Mr Sai takes us on a stroll of the farm, we see that some of the crops growing aren’t Asian, but are European. This is because they are destined for the kitchen at Amantaka. The hotel buys the food from the farm to supply its kitchens, and the farm grows according to the needs of the hotel. Mr Sai shows us beautiful fragrant mint, dill, lemongrass, basil, lettuces, bell peppers (capsicum), eggplants, and tomatoes, carrots used for Asian cooking, as well as sage, parsley, tarragon, thyme, aubergine, leaks, radish, silverbeet, beetroots, and Italian-style rocket used for the hotel’s more European dishes. We return to the open-sided pavilion to begin our Lao cooking course. There are a few burners and a big wooden bench for prep, but, unlike the Tamarind cooking school, it’s a small area, because all the classes are private, for an individual family, friends travelling together, or a couple. Today, Anousith says, I’m learning how to make a clear soup with chicken (Keng Som Kai), steamed fish with banana leaf (Mok Pa), braised pork with coconut milk and lemongrass (Moo Phak Sikai), and green papaya salad (Tam Mak Hoong). As with most Lao meals, the cooking starts with steaming sticky rice and then we work our way though the prep for the rest of the dishes. My knife skills are pretty good so we make great time working through the ingredients. While this is a ‘luxury’ cooking course, Anousith insists that the guests do the prep themselves, as they learn more than they would from just watching. And he’s right. I learn to prep the papaya the traditional way, making small cuts into the papaya lengthways, like you see women doing all over Thailand. I also learn to use the mortar and pestle properly, Anousith teaching me to how to pound and stir at the same time for the salad. Chilli goes in, which you pound, then papaya, then fish sauce and lime juice, and you taste it to test the level of spiciness. I always notice cooks constantly tasting their papaya salad in between pounding and now I find myself doing the same. 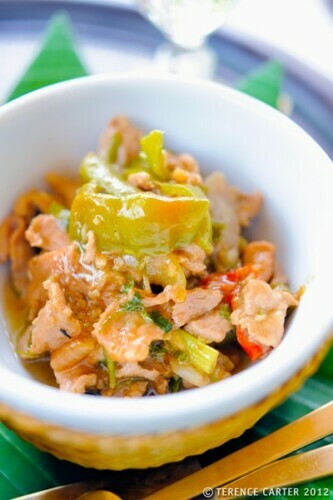 Anousith says that Laos love fermented anchovy with their papaya salad (as Northern Thais do) as they like it salty and sour, but guests don’t usually like it. We prep a tray of tiny dishes for each of the four courses, and then we cook them, one by one. Everything goes in the pot for the soup. We wrap our fish mixtures in leaves, which I’d already learnt to do, and the stir-fry takes seconds in the wok. It’s all timed perfectly so that everything is simultaneously ready so it can be served at once family-style. There are no real tricky techniques. What I’ve found is that when cuisines, such as the food of Laos and Thailand, use fresh quality ingredients, simplicity tends to win out. Even though there are often myriad ingredients in many Lao dishes, they are all there for a reason, whether they are the star of the dish or just the supporting cast. Flavour and balance is key. Once we’re done cooking, Lara and I are instructed to head over to a lovely open-sided pavilion, covered in cushions and the small traditional tables that Laos eat their meals from, and relax. 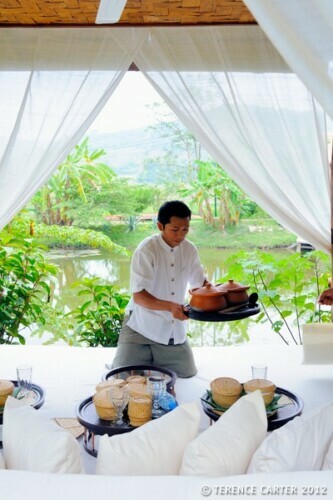 Gazing out over a tranquil lotus pond with the mountains in the distance, we’re back to being guests again as Hack, the waiter and chef’s assistant, brings over the dishes, accompanied by a chilled, crisp white wine. The cooking course has only taken us an hour and a half (Anousith says we made great time, working much faster than most) and we’ve made four amazing dishes. This is the second cooking course I’ve done here in Luang Prabang and finally I’m starting to get a ‘feel’ for Lao cuisine, something I knew little about until we hopped on our boat for our Mekong River cruise a week earlier. Aside from getting to work with such beautiful fresh produce, I have loved the fact that cooks in Laos still use the steaming baskets, the mortar and pestle, and charcoal burners. 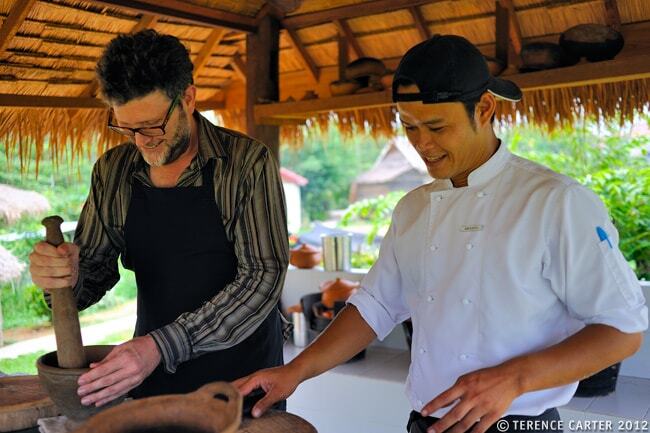 Compared to the Tamarind cooking course, undertaken by groups, and therefore more of a social experience (it’s a great way to make new friends of other travellers), the Amantaka’s class is more for couples and families who want alone-time. 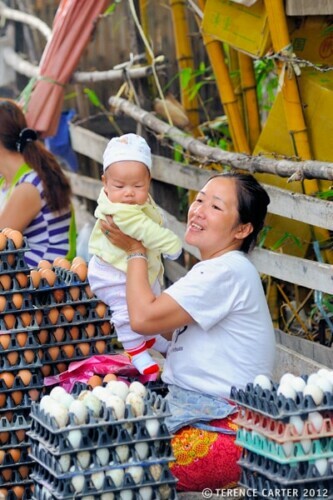 The market walks — one touring Phousi Market, the other Luang Prabang market — are each different, and both are great. I thoroughly recommended both courses — although it’s hard to beat lounging in a sala and sipping wine at the end of the cooking. I love your photos, they are beautiful. The fish on the skewers is my favorite.